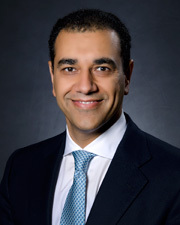 Khalid M. Sultan, M.D., is the Director of In-Vitro Fertilization (IVF) at the New York Fertility Institute. His areas of expertise are in-vitro fertilization with special attention to pre-implantation genetic screening, donor oocyte, surrogacy, and operative laparoscopyand hysteroscopy. He is the Director of Reproductive Endocrinology and Infertility(REI) at Lenox Hill Hospital in New York City and is a Clinical Assistant Professor at the New York University School of Medicine.